Author(s) Bentley, Jerry H.; Subrahmanyam, Sanjay; Wiesner-Hanks, Merry E.
The era from 1400 to 1800 saw intense biological, commercial, and cultural exchanges, and the creation of global connections on an unprecedented scale. 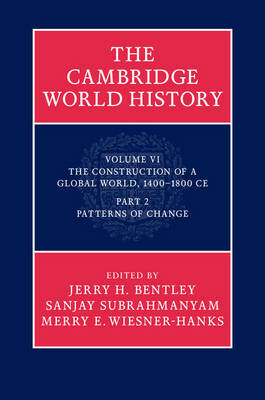 Divided into two books, Volume 6 of the Cambridge World History series considers these critical transformations. The first book examines the material and political foundations of the era, including global considerations of the environment, disease, technology, and cities, along with regional studies of empires in the eastern and western hemispheres, crossroads areas such as the Indian Ocean, Central Asia, and the Caribbean, and sites of competition and conflict, including Southeast Asia, Africa, and the Mediterranean. The second book focuses on patterns of change, examining the expansion of Christianity and Islam, migrations, warfare, and other topics on a global scale, and offering insightful detailed analyses of the Columbian exchange, slavery, silver, trade, entrepreneurs, Asian religions, legal encounters, plantation economies, early industrialism, and the writing of history.